This ring is curved on the edges for a comfort fit. The lines are hand-carved and blackened. No two rings of this style are alike. 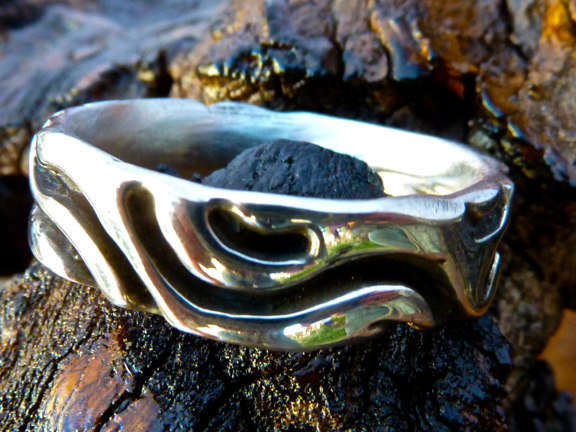 The blackened silver carved ring is popular for both men and women. One of my classic designs. 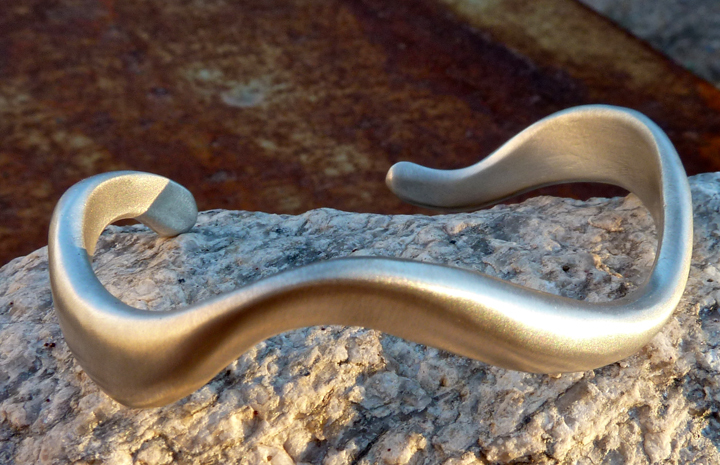 This bracelet is curved to fit comfortably around the wrist bone. The carvings catch the light so that this piece glitters in an understated way. I realized on a hike in Sedona last week that the carvings stem from my love of the crevices that form in the valleys of the desert where I grew up. 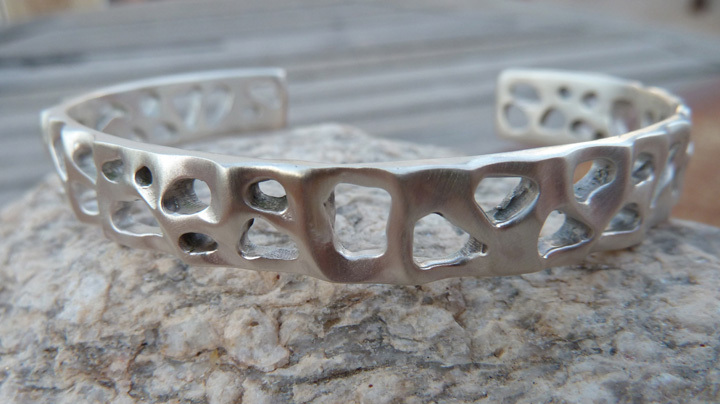 This bracelet is designed to wrap around the wrist bone for comfort. The polished silver is clean and modern. This bracelet is hand-carved and one-of-a-kind. Besides polished silver I can make similar pieces in brushed and carved, and for any size wrist. This piece is a hollow form. Both the front and the back of the pendant have hand-carved “craters” in order to let light pass through. 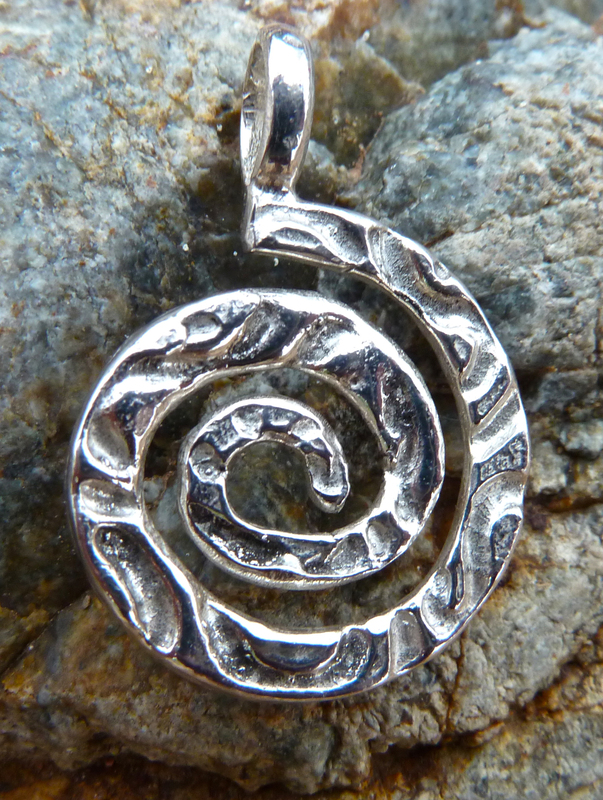 The chain runs through the middle of the pendant, giving it a more “grounded” appearance. This item was commissioned, similar items may be made to order. 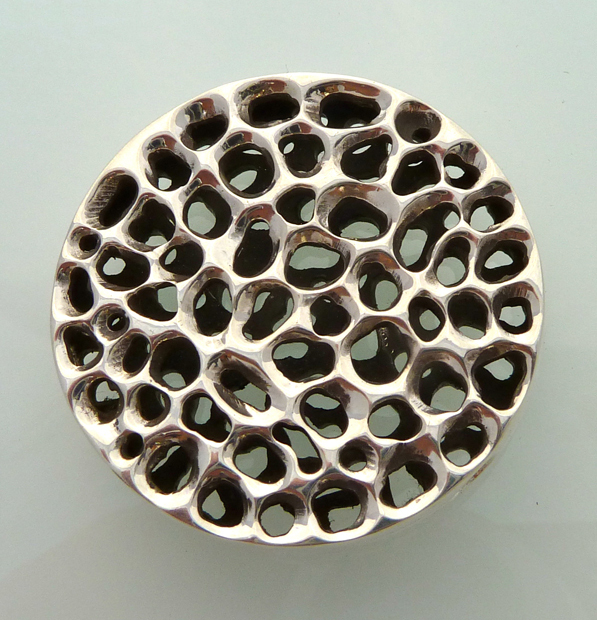 This pendant is a hollow form. It is about three inches long and half an inch thick. Both sides are rounded, one side with carvings, the other side is smooth. May be worn with the carvings in the front, or with the smooth side showing. I prefer the carved side showing, so it is shown here with the carved side in the front. While making this shield, I was focusing abundance and empowerment – and that is what this pendant represents. This piece is carved on both sides – it may be worn in one direction or another. The spiral is an image that appears in the natural world abundantly. It is recognized as a positive symbol of the journey of life. 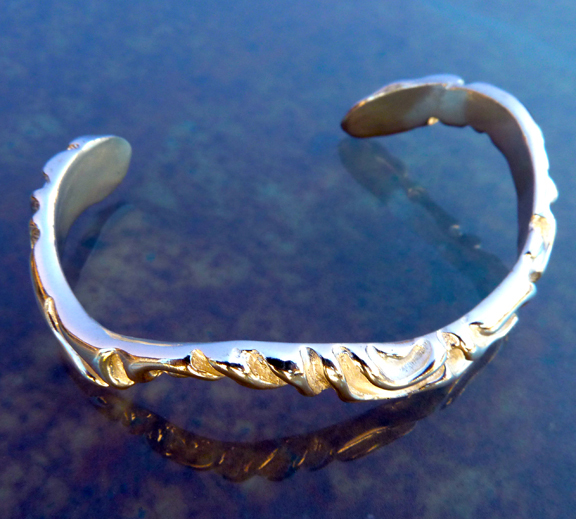 Hand-carved silver with a brushed-matte finish, this cuff is designed to be worn almost like a bangle, low on the wrist. The carvings subtly pick up light and shadow. I was very lucky to find the stone for this pendant – the size, quality, and stunning translucent green make this piece special. Depending on the light, it is either brilliant grassy green or a deep smoldering dark green. If you are into chakras, this is an excellent piece for the fourth, or heart chakra. (Green is the most widely-used color for the heart chakra). Aventurine is in the quartz family, and is useful for general, all-purpose healing. It is supposed to bring “good luck” as well. Personally, I just happen to really like green, and this piece was a lot of fun to make! It is one of my current favorites. This pendant, like all my hand-carved pieces, is one-of-a-kind. Due to the size and quality of the stone, I most likely won’t have more like it. (I may continue playing with the shape, but I never know what I will find in terms of stones). Pictured below in different light settings . . . 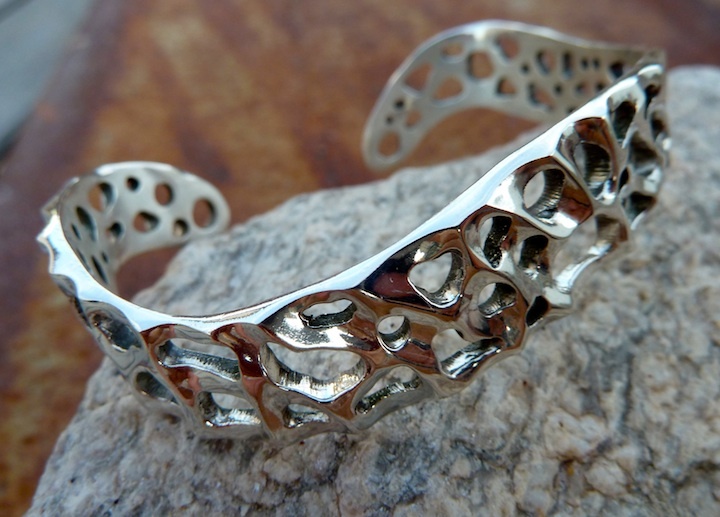 This piece has a substantial thickness, and at the same time, the hand-carved silver looks delicate as lace on the wrist. Each individual carving catches the light so that it shimmers from every angle. 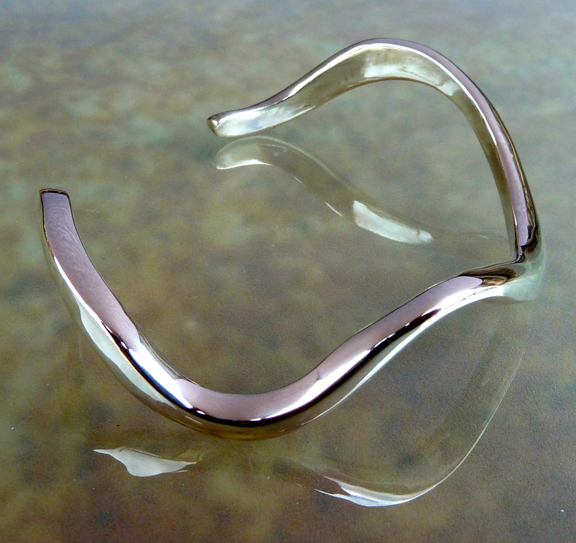 This cuff is curved for a comfortable fit.